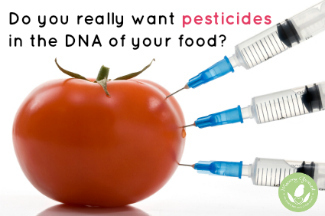 People often ask me, “What is GMO” and “What’s so bad about GMO foods?” I’m not an expert by any means, but here’s my answer: Genetically engineered foods—also known as genetically modified organisms or GMO foods (it’s basically two ways of saying the same thing)—begin as plants that have had their DNA changed in a laboratory. That would be fine—I’m no science-phobe—except for the fact that most of these changes involve pesticides, herbicides and insecticides. In addition to being produced without pesticides, organic foods are also certified to be GMO-free. The two most common are herbicide tolerance to protect them when the farmer sprays chemicals to kill weeds, and a soil bacteria gene that gives plants the ability to produce their own insecticides. A report from the Organic Center found that farmers applied 318 million more pounds of pesticides over the first 13 years of commercial GMO crop production—from 1996 to 2008—than ever before. Especially when you’re a parent, it’s so important to know when these chemicals are in our food. Even Kaiser Permanente, the largest managed healthcare organization in the United States, used its Fall 2012 newsletter as a forum to advise members to avoid GMO foods. “GMOs have been added to our food supply since 1994, but most people author wrote. “Despite what the biotech industry might say, there is little research on the long-term effects of GMOs on human health.” The article recommends buying organic in the meantime. Most of the foods on our supermarket shelves today have been genetically engineered: corn (85 percent), soy (91 percent), sugar beets (95 percent) and cotton (88 percent). Foods produced with genetically engineered ingredients are required to be disclosed on labels in 49 countries, including all of Europe, as well as Japan, Russia and China. American companies—including Coke, Pepsi, Nestle and Kellogg—currently disclose GMOs on labels of the foods that they export to those countries, but not for the same foods that they sell in the United States. I believe we have a right to know what’s in our food—from calories to fat content to genetically modified ingredients—so we can choose healthier foods for our families. That’s why I buy organic as much as I possibly can: In addition to being produced without pesticides, these foods are also certified to be GMO-free! Hi there, I read your new stuff daily. Your humoristic style is awesome, keep up the good work! Thank you!! I will keep posting!